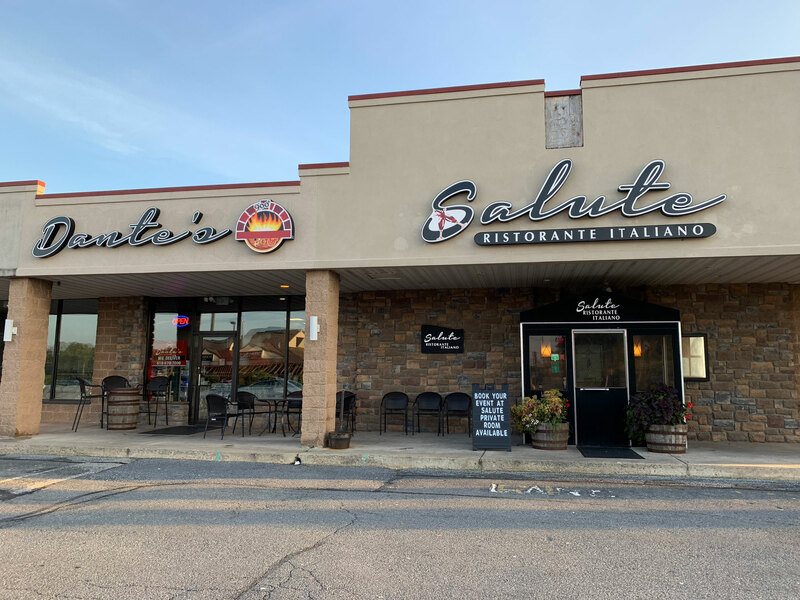 Last summer, Salute Ristorante Italiano in Sinking Spring began advertising Dante’s 900, a new artisan pizza shop that would open in the space next door. It was at the top of our list to visit during our annual National Pizza Month celebration in October. Unfortunately, “soon” was a little further off in the future as Dante’s didn’t open until after the new year. So it was back on our list – at the very top of the list – of new pizza places to check out. 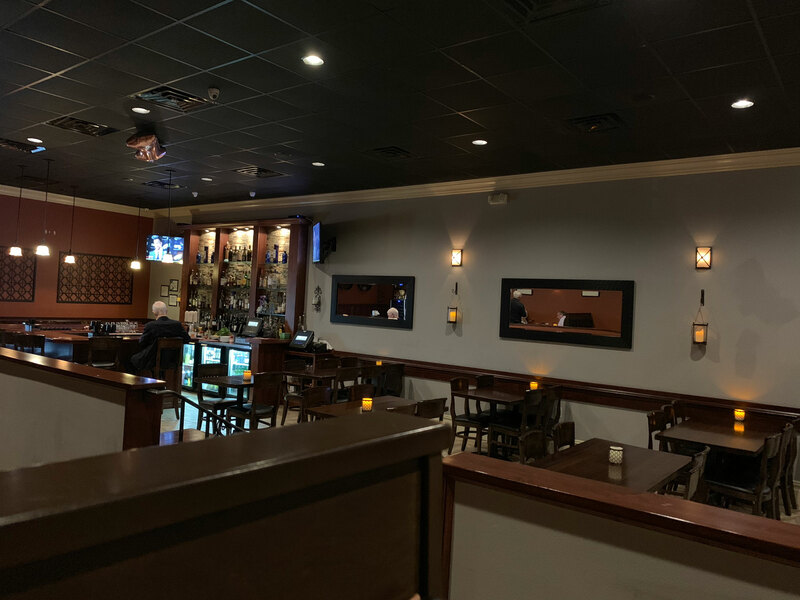 Dante’s website and PDF menu both tout the hours as 11 a.m. to 9 p.m. Sunday through Thursday, 11 a.m. to 10 p.m. Friday and Saturday. What neither mentions is that the dining room is only open from 11 a.m. to 4 p.m. We didn’t find that out until we walked through the front door and saw the note where a “please wait to be seated” sign would be expected. Instead, the sign pointed us next door to Salute for the wood-fired pizza. Salute is a very nice restaurant, a date night place that’s more upscale than most restaurants where we take Jakob. (In fact, Julie and I visited for Valentine’s Day in 2015). But we had to roll with it and after our second time asking for a high chair, we were all set in a corner booth, separated as far as possible from the rest of the dining room. Our service wasn’t great on this night. The specials were not explained well to us (the explanation we received was different than what the table behind us received). 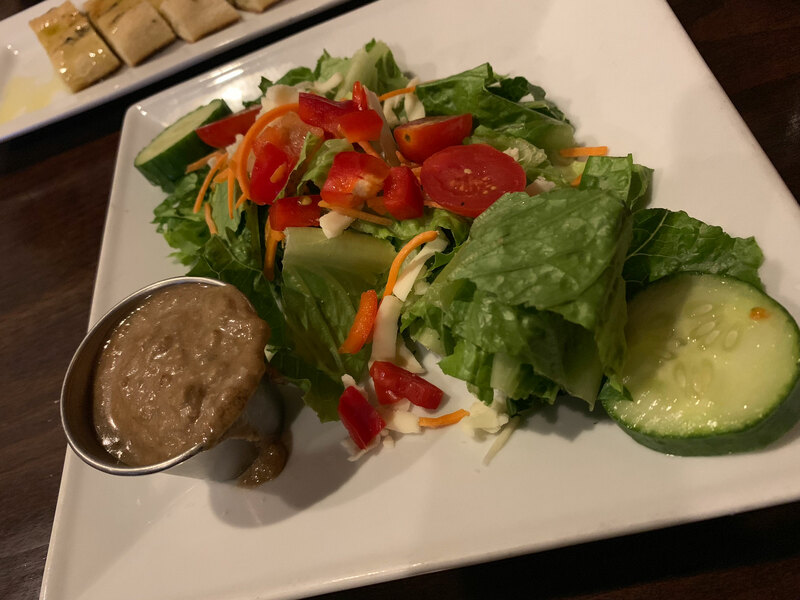 And after Julie and I both ordered Caesar salads, we were given house salads with balsamic vinaigrette. Not wanting to waste food, we ate them without complaining. I’m not big on balsamic, but the dressing was actually very good, much thicker than most vinaigrettes that I have tried. But it wasn’t a Caesar salad. Sitting down in the main dining room and looking at the full Salute menu, I couldn’t help but change my plans. 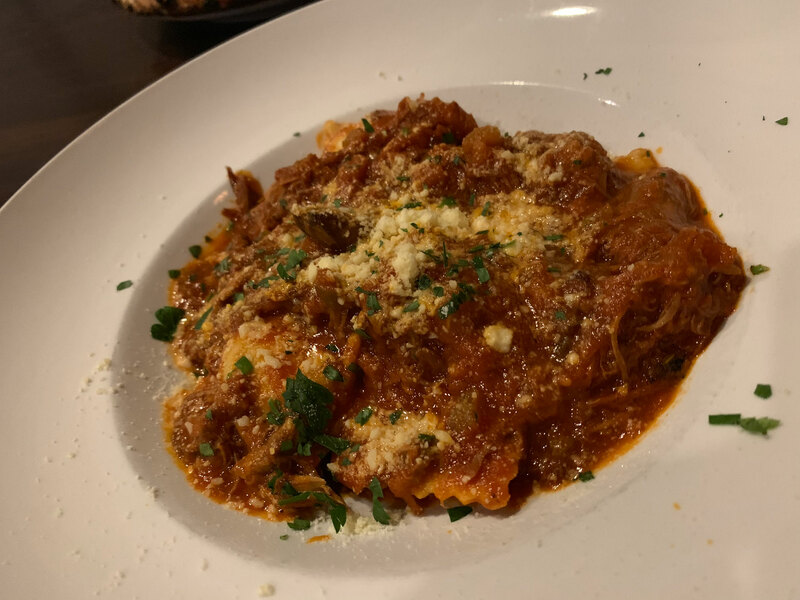 The weekly specials were inspired by Tuscany (our waitress was able to explain that the chef is doing a taste of Italy, crafting menu items themed by region), and one of those specials was the tortelli alla Mugellana ­- potato filled ravioli with duck ragu. I felt guilty for not ordering pizza, but I didn’t feel guilty after eating this. It was delicious. The filling was like a well-seasoned side of mashed potatoes. It was a perfect pairing with the duck ragu. The dark duck meat was rich and done very well. The ragu itself was a little sweet. Together, it was beautifully cohesive dish, one that I would happily order again. Julie stuck with the original plan and ordered one of the personal sized, wood-fired pizzas. Her choice: the pizza Montanara. 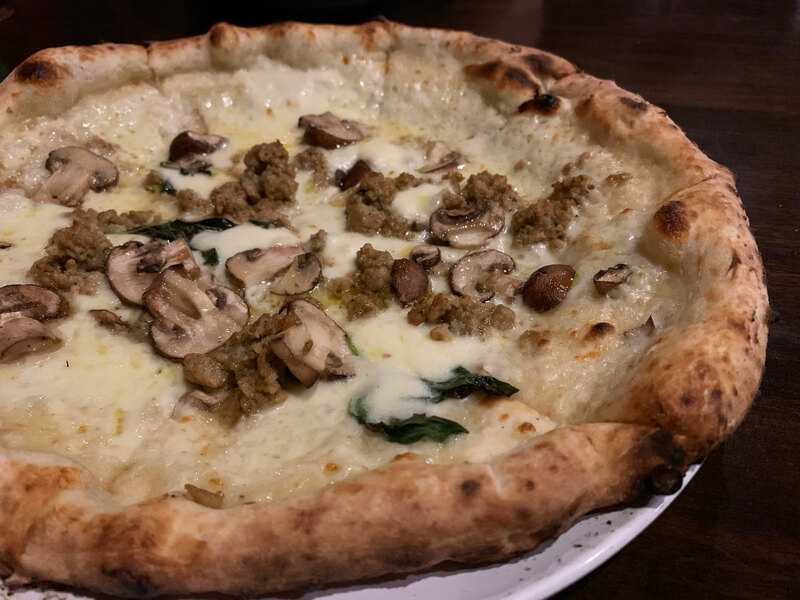 It featured mozzarella, mushrooms, sausage and white truffle Béchamel sauce. After all the anticipation, we both had to admit that it fell a little flat. Or floppy, to be more accurate. The dough was not thick enough at the center to hold the heavy toppings. And, of course, all of the toppings slid to the center. But the flavors were there. The Béchamel sauce was excellent, and gave it a creamier taste. It paired really well with the savory sausage. The mushrooms were just kind of there. If you absolutely love mushrooms, I suppose they were a good addition. The pizza, and our visit, was certainly not what we expected. There were bright spots, for sure. But overall, the experience was not on the same level as our Valentine’s Day trip three years ago. And I wouldn’t put it near the top of the list for celebrating #NationalPizzaMonth again.